Your hot tub water needs to be safe for your family to have an enjoyable time. 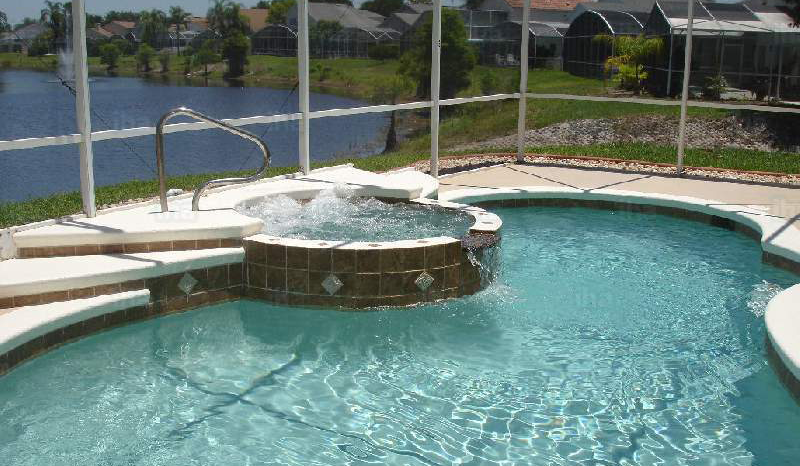 We are the Jacuzzi maintenance company that ensures all risks associated with water care are minimized. We provide safe products for maintaining a pristine condition of your hot tub. Reach us through (925) 269-9399. Correct water balance is very critical for a hot tub. Calcium hardness depends on the location of a Jacuzzi and the exact source of water. Soft water has low levels of calcium while hard water contains high concentrations of the same element. Whenever a tub is filled with water, it is important to check calcium level which needs to be 100mg/L to 200 mg/L. When the hardness is below this range, the water can be very corrosive while extreme hardness causes a cloudy pool. To raise the hardness, calcium is deposited into the tub; but to reduce it, the Hot Tub No Scale is used to correct the hardness. Call now for a free quote (925) 269-9399. The alkalinity is also a factor of the water source. The correct alkalinity lies between 125 mg/L to 150mg/L, or pH level of 7.4 – 7.6. this is the ideal water pH that ensures no corrosion happens to the hot tub vessel. If the alkalinity is too high, water loses clarity and scale starts forming and the pH requires to be raised. We recommend regular check-ups on pH level for the sake of Jacuzzi users’ comfort. This is a vital process that kills any lingering bacteria and hinders the growth of algae. The hot tub test strips are used to check the level of sanitization and chlorine is one of the best chemicals that keep the tub sanitized. Bromine is also another good option. Bromine is very efficient and it comes in form of tablet and so it is much easier to apply. Chlorine on the other hand is available in granular form which dissolves in hot tub easily. Every month, a Jacuzzi requires to be oxidized with non-chlorine shock which kills awful smells and other irritating conditions like dissolved cosmetics, sweat, and oils. We oxidize the Jacuzzi so that you may enjoy a hygienic and comfortable tub. There are numerous products we can use to keep a clean and pleasurable water tub. To control foam formation for instance we use a special product that reduces constant foams which result from aeration and repeated water circulation. Foam on water is very unsightly and it looks worse when in conjunction with lotions, oils and undesirable particles on water. If this problem persists, we drain the Jacuzzi and refill it with fresh water. Grease, body oils, perspiration, and rubbish collect at the waterline, creating an eyesore line that acts as a hood for bacteria and algae breeding. To eliminate this problem, we advise people to clean their tubs daily. We provide a water line cleaning paste to remove the dirt. If we have to refill we must use this paste first. The other thing we clean is the filter cartridge. Water circulation inside the tub reduces clarity and cleanliness and the filter is affected negatively. It must be cleaned on a monthly basis or more often depending on how frequent the tub is used. If the filter is neglected, it fails in efficiency. A sweet scent in your hot tub is always pleasant. However, bath fragrance should not be used because it increases foam formation. The only fragrance that’s good for Jacuzzi is the hot tub fragrance which is specifically manufactured for that purpose. Not only do we do jacuzzi maintenance, but also give advice to our clients. The following are precautions that we ask people to take. Users must not take alcohol before getting into the tub. Pregnant women and hypertensive people must seek doctor’s advice before using the hot tub. The Jacuzzi temperature must not go above 40⁰C. Young kids should only be allowed in when the temperature is below 30 degrees. Chemicals for cleaning and sanitization must never be mixed and must be kept away from children. Only professionals should handle the chemicals because they know how to use and store them effectively. Do not allow hot tub ﻿maintenance﻿ stress you out. Give us a call today.